Video traffic is expected to account for 80% of all consumer internet traffic in 2019, and visitors to e-commerce websites are 64-85% more likely to buy after watching a product video explaining how it works. This is because our brains processing visuals 60,000 times faster than text. Using video in your e-commerce provides customers with the information they need to make a confident purchase, without any extra effort on their part. But before you put time and money into creating product videos, you need to have your video strategy in place and understand exactly who your customers are. You must plan exactly how you will use each video, who will be watching, and where they will find the video. Video can show customers details that they couldn’t see in a static photo. It’s also a powerful medium for capturing customer’s imaginations with lifestyle imagery. Fashion retailers can show clothes on a moving model, allowing customers to see how the garments move. Sellers of camping and outdoors equipment can show equipment being used in the mountains. Toy sellers can show how easy it is to put a model together, they can show how things lights up and move. They can create their own toy unboxing videos and reviews. The possibilities are endless. Video is eye catching. It’s also easy to consume. Watching a product video is effortless. This is why video increases interaction rates for social advertising on platforms like Facebook and Instagram, helping to increase traffic as well as conversion. Every stage of your customer journey; adverts, product pages, cart abandonment emails and user guides – can all be enhanced with video. If you plan it well, you can create all your videos in a day of shooting. Videos are like windows into your store, and the more representative they are, the more buyers trust you and build momentum towards completing a purchase. Even 360 pictures can’t tell customers as much as a video. 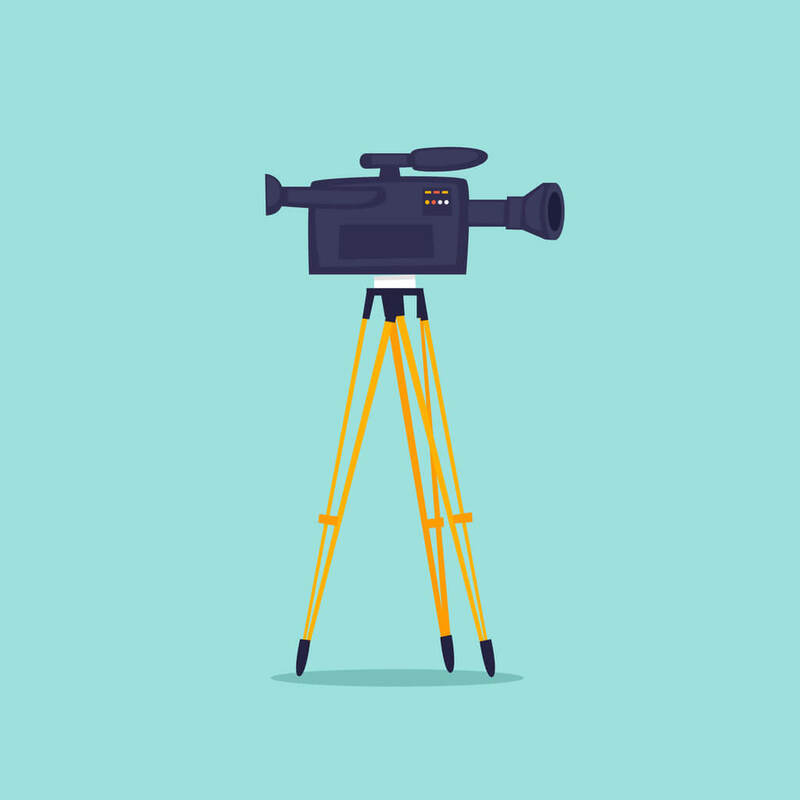 When you are making your product page video, focus on what the customer wants to know. Demonstrate assembly and features. Try to keep the product page video under a minute. Other videos may have branded intros, but its best to just jump straight to the product features here. Both your website and marketplace product page conversion rate can be improved with video. Video increases both time on page and conversion for eBay listings. In a sea of boring and unprofessional looking listings, listings with video clearly stand out as more professional and trustworthy. Use of video in eBay listings has decreased since eBay policy changed to exclude active content and external links. Knowing how much of a difference video makes to sales, Frooition developed an eBay policy compliant solution and all of our eBay designs all include the option to add video. Frooition are the only company offering video in eBay listings in a way which is compliant with eBay policy. Solo stove are a brand that use product videos really well. On the product page below they have not just one, but three different videos. They demonstrate how the product works, and allow the customer to clearly envisage how they would use it. Notice that as well as a clear demonstration video, they also have one video with a family and one with a couple – their two core buyer personas for this product. Every e-commerce business should have multiple email campaigns. An email to speak to a customer at each stage of their journey. Ideally, mails should be further segmented to connect with each customer group. An Introduction email video should introduce your brand and product or product range. Sell your brand image and emphasise your unique points. 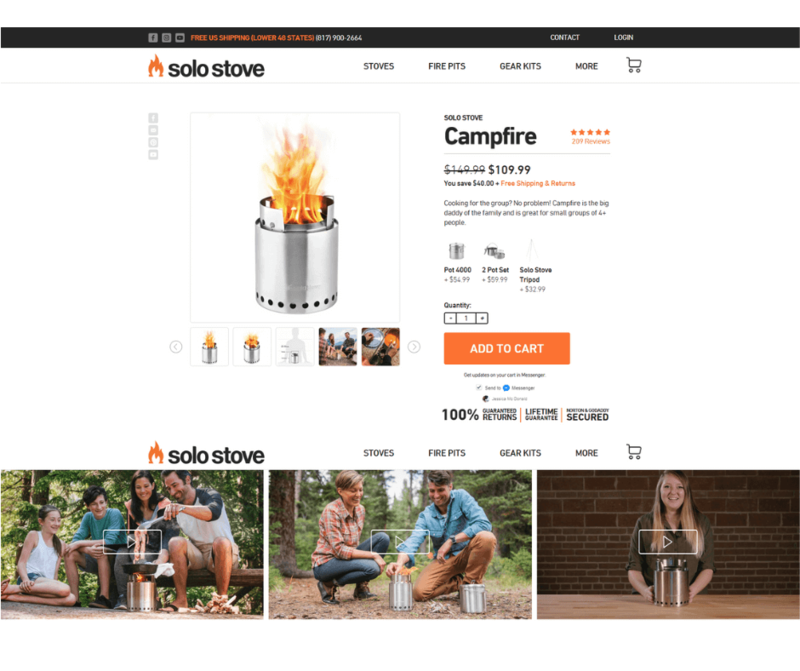 This introduction video from Solo Stove teaches customers about the brand and it’s products, while encouraging them to picture themselves using the product. Your thank you for purchasing email can capitalise on buyer’s excitement with a video encouraging them to follow you on social media. The most effective cart abandonment emails are ones with video. Think about possible objections and use your video to overcome them. Video testimonials or reviews from customers are especially powerful here. Videos are the perfect hook for Facebook and Instagram advertising. Promote videos showing behind the scenes footage, products in use and customer stories to raise brand awareness. You can use your welcome video to pull in new customers with Facebook advertising. You can also use product-specific video to capture new customers in niche markets as well as re-target customers who viewed a product page but didn’t purchase. Facebook and Instagram both have specific design, size and targeting requirements for their platforms. Be sure you follow these when uploading your video ad so that there are no delays approving and launching your ads. Remember, when you make videos for paid ads, thumbnails matter. Whether you are using text or an image, make sure that it’s engaging and will pique the interest of viewers. Paid advertising videos need to be accompanied by a clear call to action. Depending on your audience, you’ll likely want to use Shop Now, Learn More or Sign Up. This last option will grow your marketable email base, pushing them to the welcome email. You don’t want to bore customers and have them disengage, so if you do this, it’s important to make sure that your welcome series video is a bit different than the one you use on a Sign Up CTA on Facebook –– or create a new email stream for Facebook sign ups specifically, and exclude the welcome video. If you want help incorporating video into your e-commerce website or eBay listings, fill in a contact form and one of our e-commerce experts will get in touch.